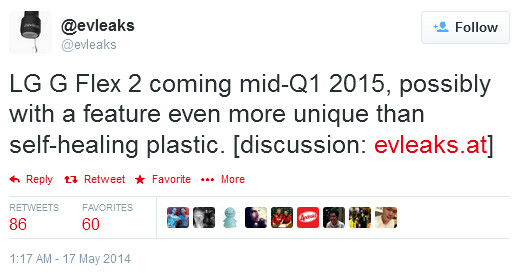 A tweet disseminated by evleaks, reveals that the sequel to the LG G Flex is expected to be released in the middle of next year's first quarter. The tweet from Mr. Leaks will have everyone's imagination all fired up. According to the tip, the LG G Flex 2 will include a feature even more "unique" than the self-healing back cover that graced the OG LG G Flex. So what might we see with the LG G Flex 2 next year? Late last year, we passed along a report that LG was going to make the LG G Flex 2 bendable at a 90 degree angle, somewhat akin to a clamshell handset. We probably will also see a bump up in resolution to 1080 x 1920, or a small drop in screen size from the 6 inches on the original model. The current combination of a 6 inch, 720 x 1280 resolution display, results in a 245ppi pixel density. This falls well short of the readings seen on the current crop of top-shelf phones. If LG goes to a 1080p resolution on a 6 inch screen, the combination would be similar to what is found on the Nokia Lumia 1520, which is a respectable 368ppi pixel density. But what will stick in everyone's mind, is the unique feature touted by evleaks. Want to venture a guess of what it could be? What is the unique feature that is tipped to be on the LG G Flex 2? "Want to venture a guess of what it could be?" A giant LG logo that roars like Godzilla when you bend the phone? Did you watch the movie yet? I can't wait....it looks awesome. I know I think it was released yesterday or something. "None of us have ever faced a situation quite like this one before..."
I KNOW ! "and ITS GONNA SEND US BACK TO THE STONE AGE"
No spoilers, but the movie is a typical Hollywood remix. It's got a lot of action, good special effects, and is generally fun, but I think the new movie makes Godzilla much more monodimensional than the old Japanese Godzilla movies. But it's Godzilla... recommended. Maybe I set myself up for disappointment as I recently watched Gojira and it was really enjoyable. Old, not great quality 4x3 screen image, but the story was much better developed. Good to know :D Did you watch it in 3D? I went for the 2D edition. I'm not the biggest fan of 3D movies, although for Avatar it was pretty well done. mid Q1 is MWC 2015 If it's capable of folding in half that would be a whole different sales story from the first gen G Flex. I thought the LG Flex would be a good phone for my mom who is 65. For one major reason the 6 inch 720p resolution. She can read and see it no problem. Now she has it and loves it for that reason. A lower resolution + a huge screen = a win for old people. It sure does I have a thl T200 a 6" at 1080p. It the same thing as on a computer just the manufacture changes the resolution not you. My wife loves her stinking Flex. Just can't put it down. A Flex 2 early next year may work for my pocketbook, still stinging from buying that beast outright. Looks like the Korean tech companies are on fire. Samsung is supposed to release the Galaxy Note 4 and the Galaxy S6 with a flexible display right? show samsung how its done lg! Samsung will show a practical bending device first at IFA 2014 with its Galaxy Note 4. Someone could make the argument "I will put my Note 4 in my back pocket and want it to bend when I sit on it"... but this is just a laugh. Even if the phone bent, you will get a dent in your Note 4 over time. Hopefully Samsung doesn't go "full ugly" with the Note 4, puts an 805 or better chip in it, 3GB+ RAM, QHD screen, great audio, and calls it a day. Bonus points if they drop the heartbeat gimmick from the S5 and include dual tone flash -- or add OIS to the camera. I don't think the Note 4 would be bendable though. 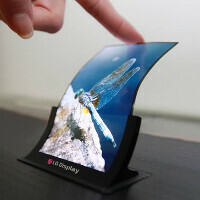 I think it will have a 3 sided curved display like the ones shown on their patents. Yeah I really would like to have the OIS on their device this time. But the S5's camera is absolutely amazing though. But it had the most superior CPU at the time?